Summary of the week – The crew arrived in Chattanooga on Monday and took a couple of days to enjoy the town. Then they set off up river to make their way to Knoxville. They ended the week in Fort Loudon Marina, about 50 miles southwest of Knoxville. The crew shoved off early from the Guntersville Lock (0755) in preparation for a long cruise. The goal was to arrive at the Nickajack Lock in the late afternoon and depending on the availability of clearing the lock, either anchor above or below the lock. These plans were almost immediately crushed when the skipper ran the boat up on a sand bar coming out of the break wall guarding the docks. He immediately shut off both engines to prevent them from sucking sand and mud up into the engine cooling system, strainers, and heat exchangers. That was a sick feeling for the skipper. Since the engines had not warmed up completely, the skipper was only idling along into the current. However, the boat got wedged up on the sand bar pretty good. After the Admiral checked the bilges below decks and confirmed that there was no water entering the boat, the skipper tried to rock the boat off the sand bar. He initially started the port engine and bumped the engine into reverse. The boat nudged back a little bit. He bumped the port engine in reverse again and the boat moved back a little more. He started the starboard engine, then bumped both engines into reverse. The boat pulled itself off the sand bar and the crew was finally under way. The sick feeling was washed away with feelings of joy as the boat headed towards the days first bridge. The cruise across northern Alabama on the Tennessee River was extraordinary. The view was obstructed a few times by industry along the banks, but for the most part this is a very isolated and remote area. By 1500 the crew left Alabama and re-entered Tennessee. Then it became obvious that the Nickajack Lock would be within reach to lock through if there was no commercial tow traffic. As the LeryLynn and Still Waters II were making the final approach to the lock, they were joined by a Ranger Tug, Tug O’ My Heart. The three boats entered the lock and were raised 40 feet up to the Nickajack Lake. Upon exiting the lock, the crew headed over to a small park that had two free docks. One dock was already full of boats. The second dock was full of fisherman. Rather than run the fishermen off the dock, the crew decided to go around to the next cove and anchor for the night. Turns out the anchor option was a perfect spot to swing on the hook for the night. With the cool night (44) and warm water, there was a heavy fog at day break. The crew had to wait for about an hour before they could see far enough ahead to safely navigate up river. Also, this next section of river is touted to be some of the best scenery so it would be worth the wait to let the fog clear out. By 0900, the crew had weighed anchor and made their way to the ‘Grand Canyon of Tennessee.’ This area was some of the best that the crew has seen on the entire loop. The river made about a dozen u—turns over the 32 miles to Chattanooga, with the mountains towering over 1,000 feet above the river. When the crew approached within 10 miles of Chattanooga they came by Williams Island. This Island played a part in the Great Locomotive Chase that took place back in April 1862. You may have heard the story told that James J. Andrews led 21 men behind enemy lines in Marietta, Georgia. The goal was to capture a railroad engine, drive the train north 100 miles to Chattanooga, and destroy the track and communication lines as they returned north. Which way to go? Sometimes you have to stop looking at the scenery and remember there are other boats out here. On April 12, 1862, Andrews and his 21 men boarded the GENERAL and then waited for the engine to stop for water and allow the passengers to eat breakfast. While the passengers and train crew were off the train at the nearby hotel having breakfast, the team unhooked the passenger cars and took off in the engine. William Fuller and two other train crew members initially gave chase on foot. Fuller soon came upon a hand propelled cart and continued the pursuit on rail. Fuller then traded the cart for the engine Yonah, when Andrews failed to destroy the engine as he passed the engine. Fuller traded the Yonah in for the William R. Smith in Kingston. 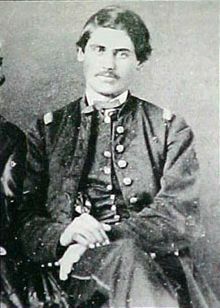 However, four miles later Fuller abandoned the Smith due to destroyed tracks and continued the pursuit on foot for three miles. Finally, Fuller came upon THE TEXAS and once again began to close in on the GENERAL. When it became clear to the crew of the GENERAL that they would not make Chattanooga, they began jumping off the engine and running to the woods to avoid capture. Within the week, Andrews and his 21-man team had all been captured. Turns out that Andrews was captured right here on Williams Island. On June 7th Andrews was hanged in Atlanta. On June 18th, seven more of the raiders were hanged. The remaining 14 soldiers planned and executed a daring escape rather than swing from the end of a rope. Eight of the 14 made it to safety. The other six were recaptured. On March 25, 1863, these six were involved in a prisoner swap and meeting with the Secretary of War, Edwin Stanton. He was so moved by their story that he excused himself and then returned with six new medals. He told the six that Congress had recently passed a law allowing medals for valor on the combat field. Stanton stepped in front of the youngest member of the team, Private Jacob Parrot and pinned the very first Medal of Honor ever awarded. After pinning the remaining five soldiers he took them to the White House to meet President Lincoln. The crew docked in downtown Chattanooga upon arrival in town yesterday. The dock is located near what was the original Ross Landing, a ferry crossing on the south shore of the Tennessee River. The ferry was run by the Cherokee Chief, John Ross. The ferry allowed transport of goods and services from the US on the north side of the river to the Cherokee Nation on the south side of the river. The crew decided to visit the Aquarium that is right beside the docks. The Aquarium is housed in two separate buildings. One is dedicated to fresh water fish and one dedicated to salt water fish. The Aquarium also is showing a special exhibit on monster fish from around the world. The crew spent about five hours wandering around the exhibits. A few of the favorites were the sea horses, jelly fish, and freshwater sting rays. On the way to the Aquarium the crew passed an interesting art project commemorating the Trail of Tears. The project had Cherokee Art on a wall overlooking a waterfall. The forced removal of the Cherokee from 1838-1839 to Oklahoma took place in response to a speech that President Andrew Jackson gave to Congress in 1829. The speech called for the relocation of all Indians east of the Mississippi River to Indian Territory (Oklahoma). Congress responded to the speech by passing the Indian Removal Act in 1830. Always remember – words matter. The Cherokee Nation was south of the Tennessee River and extended into what is now north Georgia. Some white folks illegally had crossed into the Cherokee Nation and discovered gold in the north Georgia mountains in 1828. The Cherokee were making it difficult for the white man to steal the Cherokee’s precious medal. So, the Indian Removal Act was the response to allow miners to go for the gold. The Cherokee Nation split into two factions. Those wanting to negotiate the best possible land in Oklahoma, became the Ridge Party. John Ross, the legitimate Chief of the Cherokee Nation lead the majority in the National Party. The US government negotiated a treaty with the Ridge Party. The Treaty of New Echota in 1835, was never approved by the Cherokee Nation Council. The treaty required all the Cherokee’s to relocate by 1838. The Trail of Tears was the result of the US Army’s forced removal of the Cherokee from their land in 1838, in accordance with the unapproved treaty. Twenty-five percent of the Cherokee’s died on their way to Oklahoma, including the wife of John Ross. Cherokee tradition required leaders who gave up ancestral lands to die. Two of the three Ridge Party leaders were mysteriously killed by fellow Cherokee who were carrying out the tradition. The third narrowly escaped with his life. There is an Art Museum just up the river from the docks. The museum has some interesting public art displayed around the museum. FULL COUNT is a four-piece sculpture with a pitcher, catcher, batter, and umpire. FREE MONEY is a piece with a couple dancing on a money bag. Interesting enough, the sculptor of FREE MONEY also made a piece titled LAST PENNY. What is fun about art is the different perspectives one can contemplate about the art itself. These two pieces can invoke a very different emotion if viewed separately, or together. If viewed together, the order in which you ponder the pieces also makes a difference, rags to riches or riches to rags. Hmmmmm……. The crew cast off from the deck to begin their trek to Knoxville. They had hoped to go all the way to Knoxville, but were not sure if the weather would hold long enough to make the run and get back south. Looks like another week of 80-degree weather so they will keep heading north. They might regret this decision later, but for now it seems to be the right thing to do. The weather was indeed perfect. The crew continued to cruise through beautiful fall foliage. After clearing the Chickamauga Lock they cruised around a bend and left the channel to cruise up the Hiwassee River about three miles. They had found a few anchorages to try for the night, but were uncertain about the approach depths due to low water levels. The crew was unable to get very far off the main channel before finding 4-foot water. They tried three locations before giving up and heading to the back-up plan, the Blue Water Resort. The Blue Water Resort is on Richland Creek that winds its way to Dayton, Tennessee. You may recall the famous Scopes trial was conducted in Dayton back in 1925. The skipper is trying to figure out how to go visit the restored courtroom and museum related to the trial. These short days make for shorter cruise days. This morning the sun did not break through until after 0730. Then there was still light fog in the area. The crew got off the dock a little after 0900, but almost immediately got socked in by the fog. The skipper slowed to an idle speed and moved all the way over to the port shore. Looking to starboard you could not see the shore. The skipper was sure hoping no tow boat was coming. While they were running slow along the shore the skipper did spot one Bald Eagle standing on a nest. He marked the location and hopefully the crew can get a better look on the return journey. After about four miles the fog finally gave way to the sun and the rest of the day was beautiful. The scenery continues to get better each and every day. After clearing the Watts Bar Lock, the Crew entered the Watts Bar Lake. The lake is easily the best lake along the Tennessee River so far. Its remote location from both Chattanooga and Knoxville seem to have kept the development down. Also, the lake has islands and bluffs that are just drop dead gorgeous. After six hours of cruising, the crew found a cove to pull into and drop anchor for the night. The crew had to wait for the fog to lift again this morning before setting out. After the fog lifted the crew headed to Fort Loudon Marina. The marina has a good fuel price and only charges a minimal transient fee rather than a charge by the foot of boat length. The journey on Watts Bar Lake continues to be spectacular. The crew has timed the fall foliage color change just about as good as can be done. The views just continue to dazzle. The only problem is that the pictures just do not do the actual scenery justice. After a good cruise, the crew arrived at the Fort Loudon Lock with the gates open and just waiting for us to arrive. After getting secured in the lock the lockmaster raised the boat 60 feet to the level of Lake Loudon. After clearing the lock, the crew had their first view of the Great Smokey Mountains in the distance. After landing at the marina, a couple came over to talk with the crew. The couple highly recommended scrapping the plans to go to Knoxville and head into the Tellico and/or Little Tennessee River instead. They painted a convincing argument so the skipper may spend some time recalculating the next route. Next Week – John Muir was quoted as spinning the phrase, “The mountains are calling and I must go.” The crew has decided to answer the call of the mountains, so they will go explore the waters of the Little Tennessee River and head to the Smokey Mountains. They will spend several days exploring the area and then start back to Chattanooga. Wow some beautiful pictures and scenery. Have you hooked up with our family in TN yet? I’m thinking no since I haven’t seen any pictures or mention of it. Beautiful Pics. Enjoyed your commentary. The Bakers also immigrated from Tennessee. Mountains are in the Skipper’S DNA, literally; the Fullers left Tennessee and mountains to move to Texas. I’m looking forward to hearing about your time in the Smokeys!